Russia and India Report introduces some of the sights that only the water-borne will be able to enjoy. The snow and ice will soon melt, and some of Russia’s most amazing sights will once again return from their seasonal off-limits status. RIR lists some of the sights that only the water-borne will be able to enjoy. 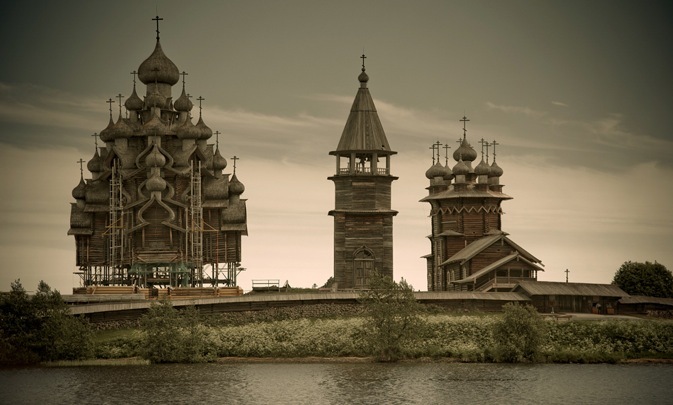 Kizhi is probably the most well-known example of ancient Russian wooden architecture on any of the country’s islands. Protected by UNESCO, Kizhi is located on an island in Lake Onega. One of its churches — Preobrazhenskaya, the Holy Transfiguration — was built in the early 18th century, in honor of the victory over the Swedes. Not a single nail was used, and legend has it that they had only one adze between them. The 22 onion domes are covered with 30,000 sheets of aspen-wood. How to get: From May to September, the “Meteor” hydrofoil leaves once per day from the riverboat station in Petrozavodsk to Kizhi. The journey takes 75 minutes each way. You can book a ticket at the riverboat station ticket kiosk. On arrival at Kizhi Island, you will be split up into (mandatory) tour groups. Return tickets for the boat cost $80, and the guided tour costs $10. On the Valaam Archipelago stands one of Russia’s northernmost holy shrines — the Valaam Monastery. People usually set aside just one day for this excursion, and many visitors think there is nothing else to see on the archipelago. For starters, there are monastic cells and Oboronny Ostrov (Defensive Island), where one section of the Mannerheim Line was built and whose long-range cannons were able to shell St. Petersburg. There are even former pagan shrines. However, to visit any of this, you will have to cross by row boat and spend the night in tents. It’s not as wild as it sounds: it comes as part of a tour to these locations from travel companies in Karelia, which is the most northwestern of Russia’s regions. The cliff-lined shores of the island are a photographer’s dream. Frankly, the weather only warms up here for one month out of the year; even then, only hardened swimmers enjoy it. The monks you may meet on the island are under a vow of silence. How to get: You can reach Valaam by special tourist ships from St. Petersburg. The length of the journey varies according to the route you choose — with or without stops on the other islands along the way. The average cruise price is around $265 per person. One of the most famous (or perhaps infamous) of Russia’s northern archipelagos is Solovki, also known as the Solovetsky Islands, located in the Arkhangelsky Region. In ancient times, the islands housed one of Orthodoxy’s most influential monasteries, which was converted during the Stalinist era into a high-security gulag. Hundreds of thousands of inmates of the Solovki Camp died here. Today, the Solovki Islands, which now fall under the protection of the UNESCO World Heritage Center, are a tourist destination and can be freely accessed by anyone. Getting to the islands, however, is not easy. The best tourist cruise ship to call here — the Vissarion Belinsky — runs on a slightly confusing timetable, and, during the short summer navigation season, there are only a tiny number of trips. How to get: To get to Solovki, it’s best to sign up for a standard trip from St. Petersburg. Four days on the islands cost for around $665 per person. The world’s largest lotus flowerbeds are to be found in the delta of Russia’s greatest river — the Volga. The area of these lotus flowerbeds covers more than 245 acres (if we count the delta along with the Caspian coast). No one knows what causes the lotuses to grow here. The main theory is that Buddhist monks brought them to the region, but other explanations hinge on birds bringing the lotus seeds involuntarily on their beaks or feet. How to get: The best place to arrange a tour of the Volga Delta is Astrakhan. Tour packages include transport, lunch, and a guide. An eight-hour excursion costs approximately $330 per person. This island landmark is well-known in central Russia and famous for the bell tower that can be seen standing in the center of the reservoir. Most of this small Volga-side town disappeared under the waves of the reservoir after construction of the giant Uglich Dam began. Most of the buildings were due to have been demolished; the Holy Trinity Monastery, along with its chapels and monastic dormitories were blown up with dynamite. However, due to some inexplicable mix-up, those who were responsible for demolishing the buildings did not get around to the belfry of the St. Nicholas Cathedral before the water came gushing through. Once the waters had engulfed the small town, authorities decided to keep the bell tower and leave it as an aid to navigation. Soil was poured around the bell tower to help the structure stand upright in the water. How to get: If you’re coming from Moscow, you can take a suburban commuter train from Savyolovsky Station to the stop called Savyolovo (the journey takes 2 hours and 20 minutes). From there, take another commuter train from Savyolovo to Kalyazin, which takes another one-and-a-half hours. The entire trip will cost around $6.65 one-way. You can go by row boat to the bell tower — agree on a price with the oarsmen who wait around on the shore for tourists. It is strangely ironic that Olkhon Island, surrounded by the waters of the world’s largest freshwater lake, has not a drop of fresh water on it — not even the tiniest rivulet. Even so, Olkhon is Lake Baikal’s only inhabited island. The word “olkhon” means “dry” in the local Buryat language. The island itself is considered to be the sacred center of the northern shamanist world: it is home to the Shaman Rock, the most revered shamanist location in Siberia. This is just one of the many reasons to come, along with Small Lake (Maloye Ozero), which separates Olkhon from the mainland. You do not need the thick skin of a walrus to swim in it: during the summer, the water temperature is considerably warmer than the rest of Baikal. Burkhan Cape is a shamanic refuge — although, quite paradoxically, Christian icons of St. Nicholas the Wondrous stood here for many years. How to get: The easiest gateway to Olkhon is through Irkutsk. There’s a local bus that leaves the bus station at 7 a.m. daily, and runs to Khunzhir, the main settlement on the island. Tickets cost $10, which includes the three-and-a-half-hour ferry crossing. This small stony island — just one mile long — was home to the Onega Monastery of the Cross. It was founded by the future Patriarch Nikon in 1656. Legend has it that Nikon survived a shipwreck and was washed ashore on the island. Out of gratitude, he founded a monastery there. The monastery buildings still stand here, but they are no longer consecrated and could use some repair work. The island is also home to an annual international jazz festival called Warm Sounds of the North. How to get: Boats run to the island from the town of Onega (9.3 miles away, $13 fare one-way), but only during extreme high-water seasons. A small strait of water divides the island in half, and you can only get from one to the other when the tide is completely out.